Self-hypnosis or autohypnosis is a form, process or result of hypnosis which is self-induced, and normally makes use of self-suggestion. Self-hypnosis can make a person more yielding than normal. Self-Hypnosis requires four distinct steps. Step 1: Motivation. Without proper motivation, an individual will find it difficult to practice self-hypnosis. Step 2: Relaxation: The individual must be thoroughly relaxed and must set aside time to perform this act. Additionally, distractions should be eliminated as full attention is needed. Step 3: Concentration: the individual needs to concentrate completely as energy is generated each time the mind focuses on a single image. Step 4: Directing: This is an option used only when the individual wants to work on a specific goal. The individual must direct their concentration on visualizing the desired result. 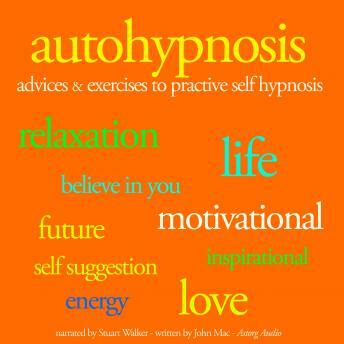 Self-hypnosis is used extensively in modern hypnotherapy. It can take the form of hypnosis carried out by means of a learned routine. Hypnosis may help pain management, anxiety, depression, sleep disorders, obesity, asthma, and skin conditions. This practice can improve concentration, recall, enhance problem solving, alleviate headaches and even improve one's control of emotions.